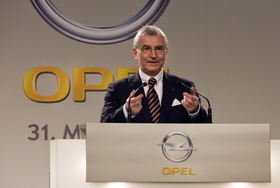 Hans Demant was Opel managing director for more than 5 years. MUNICH -- Hans Demant has stepped down as Opel managing director to become vice president of global intellectual property rights at Opel parent General Motors Co. He also will give up his role as GM Europe vice president of engineering, GM announced Friday. In the newly created position, Demant will be responsible for protecting GM's global property rights in conjunction with business alliances, partnerships and transactions. Demant will remain based at Opel's headquarters in Ruesselsheim and report to Tom Stephens, GM's Detroit-based vice chairman in charge of global product operations. “In the fast moving global automotive industry where alliances and cooperation between manufacturers are becoming more common, the value and treatment of intellectual property is critical. At GM, we need a high level focus on this matter and I am delighted that we can entrust this key function to such an experienced and committed engineering professional as Hans Demant,” Stephens said in a statement. IP rights took on new significance last year after initial GM's plans to divest a majority stake in Opel were considerably complicated by concerns the U.S. automaker's patents and technology would be transferred to strategic competitors in Russia and China. Demant also will continue to work directly with GM Europe President Nick Reilly. “I am very pleased that Opel and the entire GM organization can continue to benefit from his huge experience,” Reilly said in the statement. Demant, 59, has been GM Europe's vice president of engineering since 2001 as well as Opel managing director since 2004. He was criticized for staying in the background during the struggle to prevent Opel from following GM into bankruptcy last year.